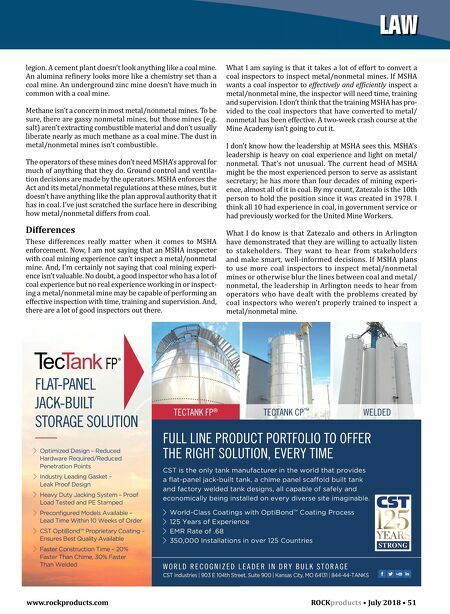 www.rockproducts.com ROCK products • July 2018 • 51 LAW CST Industries | 903 E 104th Street, Suite 900 | Kansas City, MO 64131 | 844-44-TANKS FLAT-PANEL JACK-BUILT STORAGE SOLUTION FULL LINE PRODUCT PORTFOLIO TO OFFER THE RIGHT SOLUTION, EVERY TIME CST is the only tank manufacturer in the world that provides a flat-panel jack-built tank, a chime panel scaffold built tank and factory welded tank designs, all capable of safely and economically being installed on every diverse site imaginable. World-Class Coatings with OptiBond TM Coating Process 125 Years of Experience EMR Rate of .68 350,000 Installations in over 125 Countries W O R L D R E C O G N I Z E D L E A D E R I N D R Y B U L K S T O R A G E TECTANK CP ™ WELDED Optimized Design – Reduced Hardware Required/Reduced Penetration Points Industry Leading Gasket – Leak Proof Design Heavy Duty Jacking System – Proof Load Tested and PE Stamped Preconfigured Models Available – Lead Time Within 10 Weeks of Order CST OptiBond™ Proprietary Coating – Ensures Best Quality Available Faster Construction Time – 20% Faster Than Chime, 30% Faster Than Welded ¨ TECTANK FP ® legion. A cement plant doesn't look anything like a coal mine. An alumina refinery looks more like a chemistry set than a coal mine. An underground zinc mine doesn't have much in common with a coal mine. Methane isn't a concern in most metal/nonmetal mines. To be sure, there are gassy nonmetal mines, but those mines (e.g. salt) aren't extracting combustible material and don't usually liberate nearly as much methane as a coal mine. The dust in metal/nonmetal mines isn't combustible. The operators of these mines don't need MSHA's approval for much of anything that they do. Ground control and ventila- tion decisions are made by the operators. MSHA enforces the Act and its metal/nonmetal regulations at these mines, but it doesn't have anything like the plan approval authority that it has in coal. I've just scratched the surface here in describing how metal/nonmetal differs from coal. 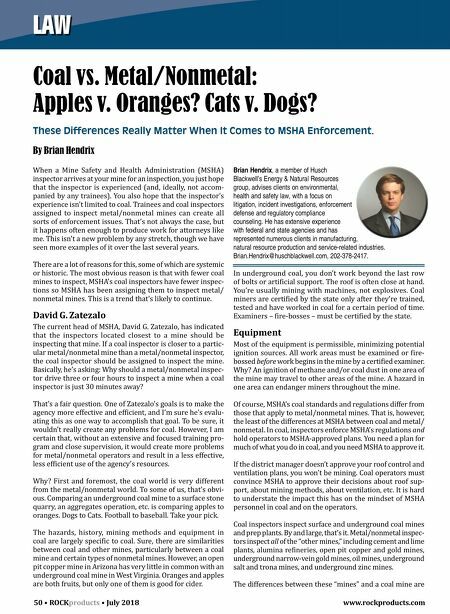 Differences These differences really matter when it comes to MSHA enforcement. Now, I am not saying that an MSHA inspector with coal mining experience can't inspect a metal/nonmetal mine. And, I'm certainly not saying that coal mining experi- ence isn't valuable. No doubt, a good inspector who has a lot of coal experience but no real experience working in or inspect- ing a metal/nonmetal mine may be capable of performing an effective inspection with time, training and supervision. And, there are a lot of good inspectors out there. What I am saying is that it takes a lot of effort to convert a coal inspectors to inspect metal/nonmetal mines. If MSHA wants a coal inspector to effectively and efficiently inspect a metal/nonmetal mine, the inspector will need time, training and supervision. I don't think that the training MSHA has pro- vided to the coal inspectors that have converted to metal/ nonmetal has been effective. A two-week crash course at the Mine Academy isn't going to cut it. I don't know how the leadership at MSHA sees this. MSHA's leadership is heavy on coal experience and light on metal/ nonmetal. That's not unusual. The current head of MSHA might be the most experienced person to serve as assistant secretary; he has more than four decades of mining experi- ence, almost all of it in coal. By my count, Zatezalo is the 10th person to hold the position since it was created in 1978. I think all 10 had experience in coal, in government service or had previously worked for the United Mine Workers. What I do know is that Zatezalo and others in Arlington have demonstrated that they are willing to actually listen to stakeholders. They want to hear from stakeholders and make smart, well-informed decisions. If MSHA plans to use more coal inspectors to inspect metal/nonmetal mines or otherwise blur the lines between coal and metal/ nonmetal, the leadership in Arlington needs to hear from operators who have dealt with the problems created by coal inspectors who weren't properly trained to inspect a metal/nonmetal mine.